Cottage #4 was completely renovated for my personal use and never intended as a rental. Well a move to the West Coast changed all that. So…Cottage #4 has everything I love and wanted in a cottage, a big kitchen designed for a cook.. with great appliances, great pots and pans, good knives, big gas stove, Bosch dishwasher, redwood counters, and an old soapstone sink. The bedroom has a comfortable queen sized bed, large window and skylight. The bathroom is beautiful, but the outdoor shower is all you will use. There is a big screen porch overlooking a private yard and wooded wetlands. There is cable TV (flat screen), and high speed internet. Its a spacious cottage perfect for two people but with a pull out couch for a child or overnight guest. Just 2 miles to the national seashore beaches and a a short walk to beautiful Fort Hill and views of Nauset Marsh. My past guests have all said how much they feel at home in the cottage...and never want to leave. The bathroom also has a vaulted ceiling, its full of light and just redone. An old farm cabinet has been refinished by my Dad and is topped with honed granite serves as the bathroom sink and counter. The shower/tub is tumbled white marble. The room is wain coasted with a slate floor. There is also a large front loading washer and dryer in the a closet in the bathroom. Full sized Gas range and oven. Usually have basics on hand, flour sugar salt oils vinegars, but no guarantee. The kitchen was designed for a cook and has everything you need to cook. Gas stove, great knives, great pots and pans. you will never find a better rental kitchen. Cambridge Soundworks Table top Stereo with IPod Dock. I loved the accommodations at Michael's seaside cabin. It was super clean, decorated beautifully, with a well-stocked chef's kitchen, and many other amenities at an affordable price. We loved Nauset Beach the most. We will return for sure, it was so nice to have our German Shepherd with us on vacation this year. You will not be disappointed staying here! Perfect cottage, great condition, and michael was really helpful. Beautifully appointed charmingage. Our daily walk to fort hill was so enjoyable. Beautiful appointed cottage with all the ammenities needed for an awesome cottage. Great location with awesome hike nearby with amazing views. Highly recommend this place. Very responsive host!! We had a wonderful stay at the cottage. The location is great - close to beaches, bike path and restaurants and grocery stores etc in Orleans. Even though it's a cottage, the layout, use of space, and screened in porch makes it feel larger. Michael was very responsive to all of my email and questions. I highly recommend it! Lovely cottage in a convienent area with easy access to many activities including wonderful beaches. 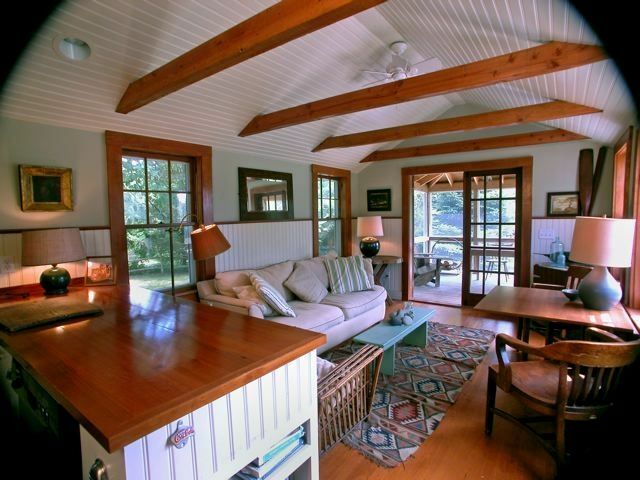 The cottage is aesthetically appointed in good taste, with many references to the Cape Cod beaches and sea. It is comfortable and clean. It is outfitted with anything you might need for cooking a snack or a gourmet meal. Many other amenities such as living room area with tv and music services, lovely screened in porch and washer and dryer. The area is quiet although we were there at the very beginning of “ the season” so it’s possible that it can become a bit busier. You can hear the traffic on Route 6 but it was not an issue and the bedroom is on the side away from the road. Something you need to be aware of is that you need to bring your own sheets, blankets and towels. Not too much of an issue with someone traveling by car but if you are flying it could be a problem. It is conveniently located in the upper (not sure this is the proper term) area of the Cape, with easy access to P- town, beautiful beaches, hiking areas, cute towns (Chatham and Provincetown were the my favorites, although they are quite different), grocery store and restaurants. We had a wonderful, relaxing time and I would recommend staying here. My husband and I just came back from cape cod and stayed at cottage #4, what a retreat! It was just what I was looking for, cozy, homey, close to restaurants, beaches and hiking trails. It has a backyard so my dog could have some fun too. This cottage is supplied with everything you need. Perfect for a couple and a dog! Michael was so nice to let us rent it in the last minute and we are truly thankful! The Cottage is located on an old apple orchard at the base of Fort Hill, part of the Cape Cod National Seashore. Just a one minute walk you come to an old Whaling Captains home and a few minutes later to the top of Fort Hill, which has amazing views of Nauset Marsh. There are walking trails all around. Its a 1/2 mile to the Cape Bike trail and just 2 miles to the National Seashore beaches and the town Bay Beach. The Outer Cape is beautiful as the national Seashore has reduced the amount of development you find on the rest of the Cape.